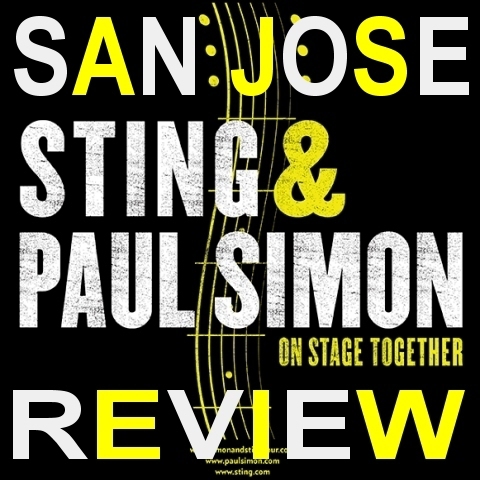 As the lights dropped in the SAP Center, a sudden and powerful applause erupted in the near-maximum capacity building in anticipation of witnessing two rock music legends: Paul Simon and Sting. "Paul and I share a lot of musical curiosity about a spectrum of music that's pretty wide, and as vehicles for songwriting. So we have lot in common," Sting said in an interview earlier this month with Billboard magazine in regard to touring with his New York neighbor, Paul Simon. Coming from his early years of British punk, reggae and new wave, one would never think to put Sting and the folk, story telling, sounds of Paul Simon together on tour. But from the moment they hit the stage and shared the first verse of Sting’s Grammy award-winning "Brand New Day," it was evident that the two on stage together made sense. The pair was backed by a heavy-hitting 12-piece band including two drummers, multiple guitarists, backup singers and a firing horn section. Simon took first leave of the stage as the 12-piece band split and shifted to their appropriate bandleader. Sting took charge of the crowd, triggering an urge for everyone to stand up and dance to the addicting grooves of classic Police songs such as "Walking On The Moon," as well as his solo tunes. Captivating the audience with his 1975 classic "50 Ways To Leave Your Lover," 72-year-old Simon soon returned to the stage with his band, looking as if he was right at home. Though the tempo and mood of the music was much different from Sting’s signature sound, the audience was equally entranced by Simon’s storytelling ability and the catchy yet smooth pop/folk hooks and chorus lines. When percussionists started playing the intro to "Graceland," everyone exploded out of their seats to dance and sing along with the New York legend. The energy of the arena was exceptionally high, and it was apparent that the musicians felt the audience’s presence as they played their instruments with passion, perfection and enormous smiles on their faces. The two bands reunited in their original 12-piece format as Sting took the stage once again with authority and showed his true vocal ability with "Message In A Bottle," "Roxanne" and "Desert Rose." Music has the ability to become a powerful and uniting instrument for people all over the world, and at no time was this more evident than when two New York apartment neighbors with different musical backgrounds came together and left San Jose’s SAP Center in amazement. The night would end with two influential songs, sang similar to how the concert started as a duet, but ended with the 1970 Simon and Garfunkel timeless piece "Bridge Over Troubled Water." 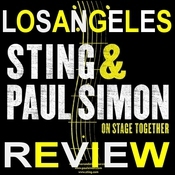 The band left the stage as Sting and Simon paid their respects to a mutual and recently fallen influence, Phil Everly. The rock royalty duo played an acoustic version of The Everly Brothers’ "When Will I Be Loved" that left the crowd with an emotional, influential and satisfied feeling at the end of a magical and rare night in San Jose. 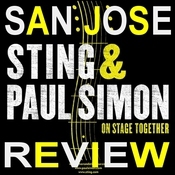 For more reviews from the San Jose show please visit http://www.sting.com/tour/date/id/2905 where you can view the setlist, leave your comments about the show, post images of your ticket stub and your photos from the show!